I am happy to announce that the date for the 4th Phoenix Type-In and Round-Up has been set. Again, Lux has kindly allowed us to host our event at thier famous "farmhouse" table. 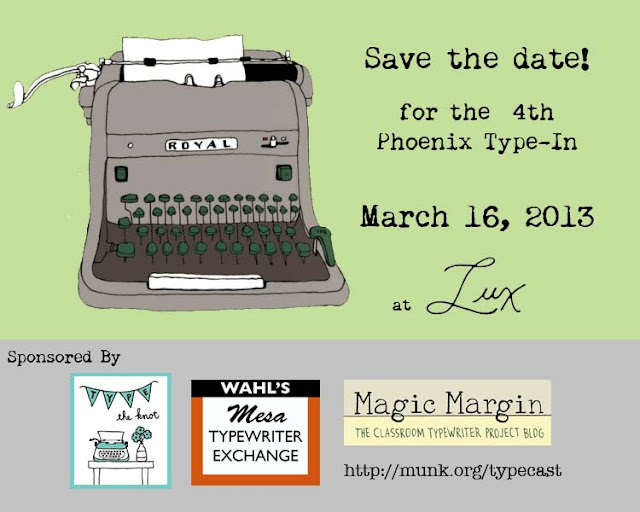 Bill Whal from the Mesa Typewriter Exchange will be on-hand to diagnose youe typewriter woes and offer some sage advice. I also wanted to use this post to soft-launch a new side-business of mine: Type the Knot. If you want to know more about this visit http://www.typetheknot.com The site is still in formation, but I wanted to share none-the-less. Ryan, this only gives you six days to get back to Phoenix from the first Australian type-in, in Brisbane, but I know you will make it! I love the Type the Knot concept, by the way, very nice blog.